Have you ever watched a television program or read a text book with images of feathered dinosaurs and wondered how the producers or artists knew, and how they determined the colours of these ancient avian feathers? Up until quite recently, determining feather colour was simply an educated guess, and involved a healthy dose of speculative artistic license. Now, using highly advanced technology, modern science is removing the need for guesswork. Ryan Carney, from Brown University in the United States, and a team of Swedish scientists are using high-sensitivity analytical techniques and shedding new light (and colour) on to paleontological investigations. Archaeopteryx lithographica was unearthed in Germany in 1861, from the 150 million year old Solnhofen Lagerstätten lithographic limestone. In Germany it is known as ‘Urvogel’, which means first or original bird. Paleontological studies revealed a mosaic of reptilian and bird characteristics, including an isolated feather, leading scientists to conclude that Archaeopteryx, “ancient wing”, is the missing link between non-avian dinosaurs and birds, providing conclusive proof that modern birds are direct descendants of small-carnivorous dinosaurs. Archaeopteryx has proven to be rich inspiration for a wide range of studies and literature on the origin of birds, though, up until a study published two years ago, little was known about the colour and nature of the isolated Archaeopteryx feather. In 2012, Ryan Carney’s study was published. 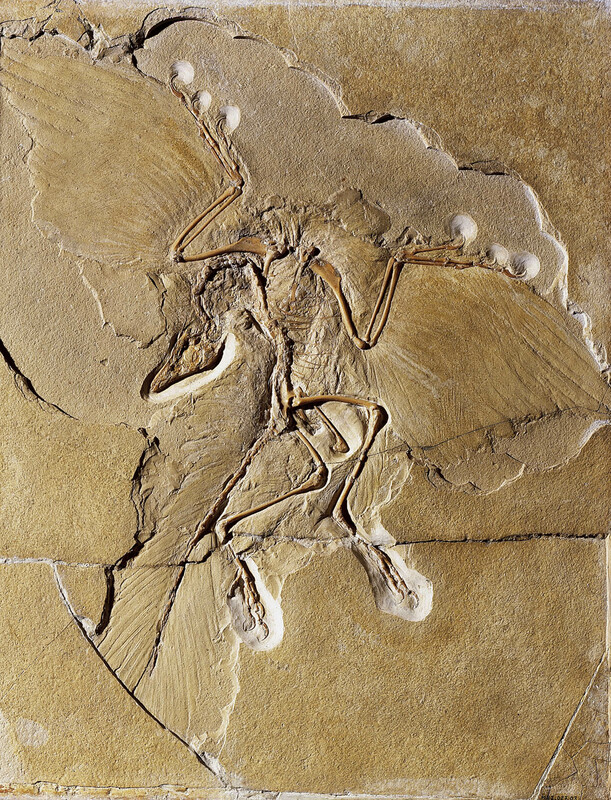 It incorporated scanning electron microscopy and using a phylogenetically diverse database of extant bird feathers to reconstruct the feather colour and nature of Archaeopteryx lithographica. Statistical analyses of melansome (colour-imparting organelles) morphology led Carney and his team to predict that the original colour of the isolated Archaeopteryx feather would have been black, with a 95% probability. They also concluded that the feather was an upper major primary covert wing feather. Carney explained his inspiration for conducting his research study: “I got the idea for the Archaeopteryx feather colour study during a conversation with Jakob Vinther, who was a fellow classmate at Yale at the time and who had made the original discovery that melanin fossilizes. Because this isolated feather is preserved as a dark residue, unlike the feather imprints of the Archaeopteryx skeletonsm, I thought that it would be the perfect candidate in which to search for melanosomes “. Soon after, two papers were published which contradicted Carney’s findings and offered alternative interpretations. The first paper focused on the distribution of organic sulphur within the feather, which was imaged via synchrotron. This authors concluded that the feather would have been black and white. 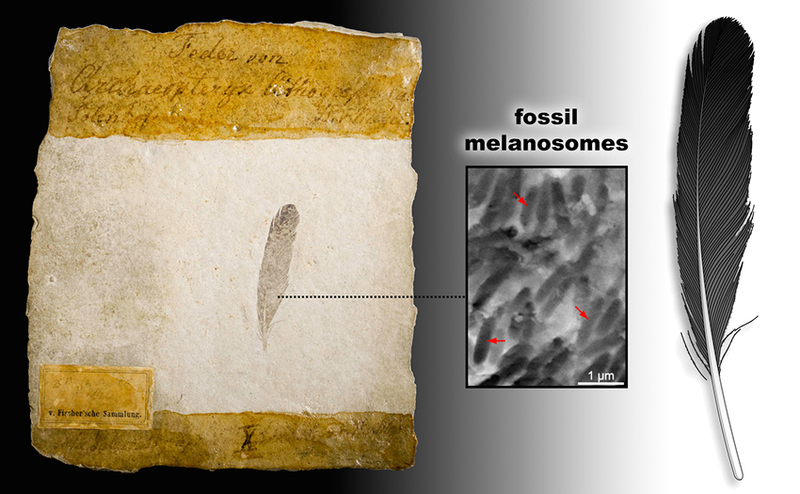 The second paper, drawing on similarities between size and shape, suggested that the fossilized microbodies in the feather were in fact bacteria, and not melanosomes, which caused controversy. Utilizing highly sensitive and sophisticated analytical techniques, such as Time-of-Flight Secondary Ion Mass Spectrometry (ToF-SIMS), the team found that the inner vein of the feather, which one of the 2012 papers suggested was white, was saturated with black melanosomes. This finding was critical as white feather colour is only produced in the absence of melanosomes. 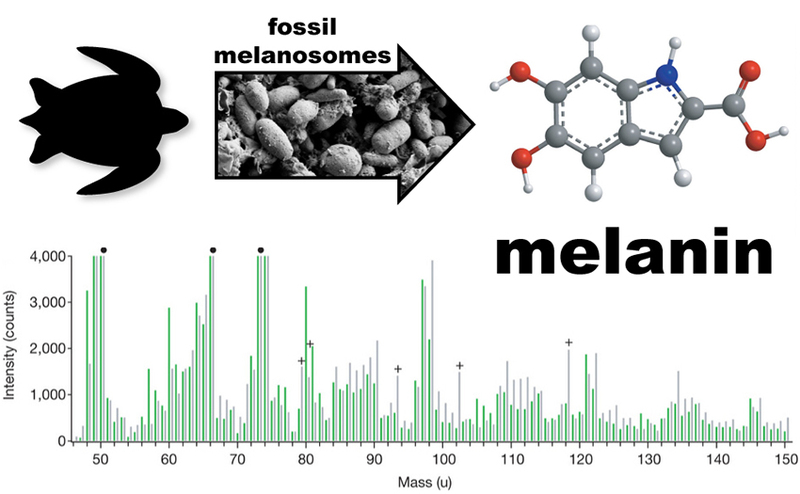 These new chemical techniques allowed the detection of melanin molecules, providing definitive proof, once and for all, that melanosomes can be preserved in the fossil record. These advanced methods and further analysis enabled the team to paint a clearer picture of the feather as being matt-black, with a darker tip. A colouration that is suggested would have been structurally advantageous to the plumage during the evolutionary stage of dinosaur flight. In modern birds, melanins are firmly cross-linked with proteins. These cause pressure which substantially augments feather keratin hardness and strength, with wing feathers, and especially the feather tips, displaying the greatest tendency to melanisation. fossil leatherback turtle and melanosomes (pigment structures), which contain the “molecular fingerprint” for melanin (bottom). Images modified from Lindgren et al 2014 Nature. Carney expands on the significance of this finding: “Presumably, many of the same qualities of black eumelanin that allow it to preserve in the fossil record are the same that provide structural support in feathers. This has been well documented in the literature, specifically that the black melanin/melanosomes makes feathers harder, thicker, and more resistant to abrasion (such as during flight). This is why in modern birds, the wing feathers and especially the feather tips (where aerodynamic forces are high) are the most likely areas to be heavily pigmented. While we cannot say that this black colour proves that Archaeopteryx was a flier, we can say that it would have similarly strengthened this wing feather “. Carney’s fascinating research will hopefully offer further understanding of dinosaur evolution palaeobiology and aesthetics, giving us increased understanding of how fossilised animals once lived and how they looked. He’s excited about the discoveries that could be found through utilizing their sophisticated and powerful analytical techniques “I believe that molecular methods such as ToF-SIMS will continue to play an important role. The hope is that new discoveries of well-preserved specimens, coupled with these new technologies, will continue to allow us to put colours on dinosaurs and other extinct creatures with scientific scrutiny instead of simply artistic license”.